Do you have all the information you need for negotiations with your potential tenant? The financial implications of having a tenant default on a lease can be severe and often a simple database “snap-shot” only reveals a part of the prospective tenant’s financial story. 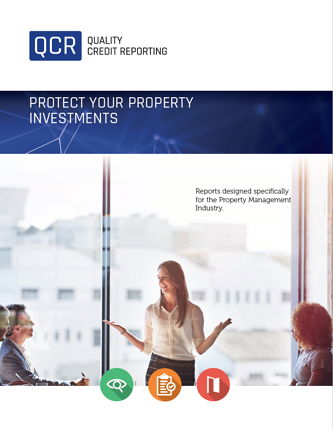 In this day and age, when it's becoming increasingly important to do a thorough background check on tenants, our team at Quality Credit Reporting provides the tools you need to protect your business and make informed decisions about prospective tenants. Quality Credit Reporting specializes in creating flexible, in-depth comprehensive reports that include valuable credit information typical database searches would not. This additional credit information on prospective tenants gives property managers the negotiating tools they need to secure a lucrative tenant in their valuable space. Corporation Profiles: This report is obtained directly from the Ministry in the applicable jurisdiction, verifying the corporation’s current, full legal status with Companies Branch and Corporate Tax Branch. Amalgamations, business name registrations, name changes, directors, officers, and registered head office information is confirmed. Professional Credential Searches: Confirmation of registration within the profession is provided (i.e. doctor, lawyer, dentist, etc. ), revealing registration status, date of registration and other significant details. Bank Ratings: Current, up-to-date banking information is obtained directly from financial institutions. Term loans and operating lines are confirmed, including particulars on authorized limits, current balances, payment, and NSF history. Landlord References: Information obtained includes current and previous information such as length of the lease, type and amount of space, monthly payments, and repayment history. Trade References: Trade references are contacted for current, up-to-date information regarding account balances, credit limits, payment terms and payment experience. Bankruptcy Search: Identify past and current bankruptcies, along with consumer proposals, debt consolidation orders, commercial proposals, receiverships, and CCAA filings. Personal Property Lien Registrations: PPSA (Personal Property Security Acct) updates will identify many types of security agreements and liens, including secured borrowing facilities, lines of credit, term loans and lease agreements. Negative registrations such as tax liens, writs of enforcement, crown charges and statutory claims are also revealed through the search. Land Registry Sub-Search: Establishes whether a prospective tenant owns real property and provides important particulars including, outstanding mortgages and other financial encumbrances. Company Website: Websites can provide useful information with regards to the investigation of the prospective tenant. Website addresses are provided with direction to areas in the site, which may be of interest to the landlord. Historical Information Section: Historical information can be valuable, in conjunction with the current investigative information gathered. Utilization of a database reveals payment trends and history.